#HoppyHalfDeal - Have a blast making, saying and writing noun-verb-object sentences to tell about spring time fun! This multiple activity set includes Wh question activities, games, spinners, sorting mats, writing and cut/glue worksheets with pictures. 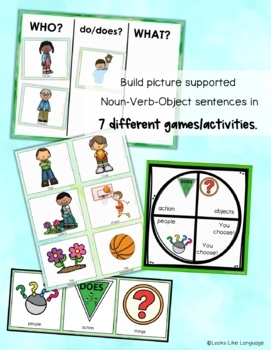 The picture supports are helpful for limited readers, autism, AAC, ESL and literacy centers, too! 4. 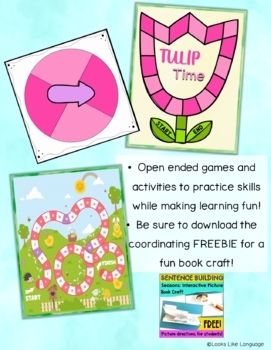 An interactive book activity: Get the co-ordinating free download! SAVE money! This packet is included in both of these bundles. * This is a great product that I have used with many of the students on my caseload! It can be difficult to find higher level activities that I can use with my severe-profound population and this product has served me so well in that capacity! 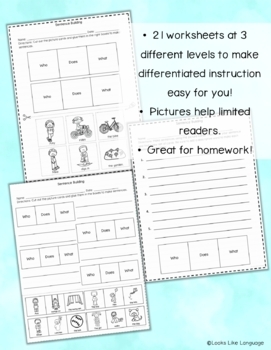 * This has been fantastic for my extended resource room where I have a variety of skill levels. Thank you! * Just what I needed! I really like these packets for sentence formulation!! 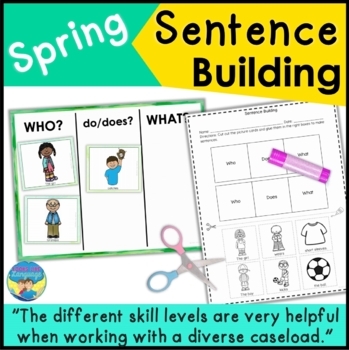 * Perfect variety of language activities with a spring theme for my students, thank you! * Always looking for seasonal materials that provide practice in sentence structure. The different skill levels are very helpful when working with a diverse caseload. Adapted Book Activities: At the Playground!